Sample boxes have always provided companies opportunities to reach consumers with new and trusted products they might like to purchase or tell their friends about. 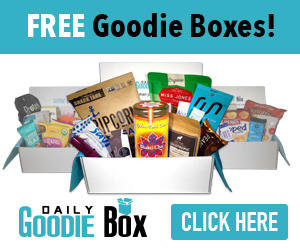 Now there's a sample box subscription available for free from Daily Goodie Box that's entirely free. I received my Daily Goodie Box in the mail and I'm impressed! It's loaded with goodies! Both full size products and samples are included. I received a lot of yummy and healthy food including a Raw Rev Gio Creamy Peanut Butter & Sea Salt Protein Bar, Navitas Naturals Sweet Maple Nut Bar, Navitas Naturals Tangy Berry Acai Nut Bar, Artisana Organics Raw Cashew Nut Butter, Artisana Organics Raw Coconut Butter, Eat Dream Be Banana Lavender Dream Bar, Lenny & Larry's The Complete Cookies in Snickerdoodle flavor, Deep River Snacks Sweet Maui Onion Kettle Chips, Cisse Cocoa Co. Hazelnut Hot Cocoa Mix, The Chia Co. Chia Shots, Organics Gemini Tigernut Smoothie Mix and Team Skinny & Colon Tea Bags. I don't know which to try first...salty or sweet? I also received some beauty products including Dude Wipes and Babo Botanicals Sport Stick Sunscreen.